december 2017 - sorry that a prompt appears for some users informaing of a new release. 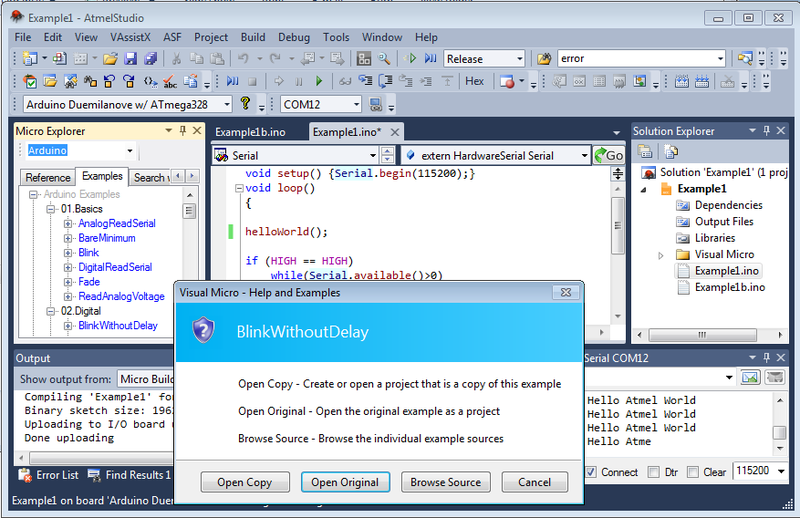 It's a mistake, the release is ony for visual studio 2012+ and Atmel Studio 7. 17th June 2016: Important note about As6.2 and Visual Micro at the bottom of this page. Visual Micro is a free plugin that implements the simple but powerful Arduino development features into the Atmel Studio 6.2 Ide. The Atmel Studio IDE is a great fit for Arduino because Atmel Corporation are the manufacturers of the Arduino micro-processors and provide the IDE for free. The Atmel teams also create the toolchains that the Arduino IDE and Visual Micro use to build and upload. Atmel Studio with Visual Micro enables ANY Arduino project (with code completion) to be developed, compiled and then uploaded to any Arduino micro-processor. By default, the plugin shares the sources and tools of the Arduino Ide which means we use the same code, it's just the ide that is different! The Atmel tools are at the heart of the Arduino Ide which is reliant upon them for compile and upload. It makes perfect sense to develop Arduino using Atmel Studio along with the rich user interface and other great development tools that it provides. View Visual Micro's page in the Atmel Studio Gallery. Please add a gallery review. Thanks!! Supports a combination of multiple .ino sketch and C++ (cpp) source codes per project which ensures that projects remain compatible with the open source community! The Arduino plugin for Atmel Studio provides the features of the Arduino ide but inside Atmel Studio. 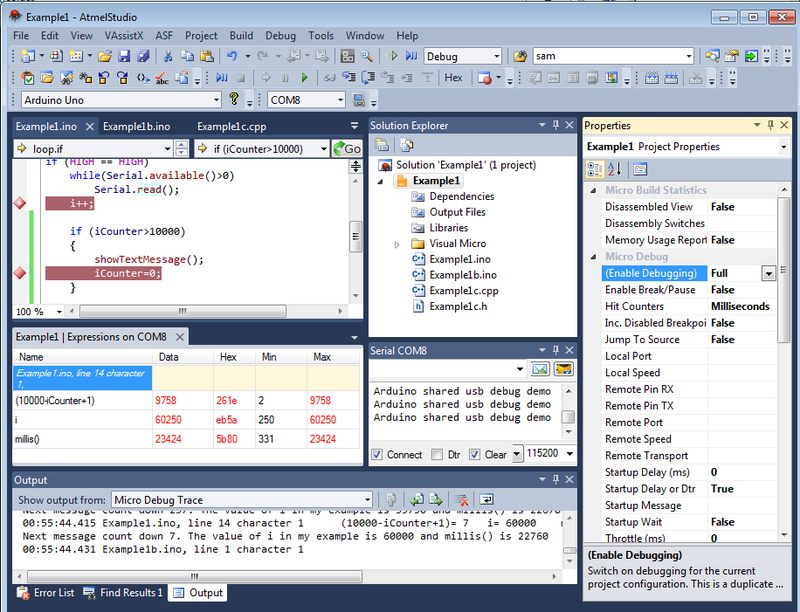 Lightening fast compiler, one-click compile and upload, intellisense, serial monitor and more. An optional Arduino usb debugger is also available at a small cost. Works with all genuine and custom Arduino hardware. The Arduino IDE and Atmel Studio share the same configuration options when installing custom hardware and/or Arduino libraries. This means that whatever works in the Arduino IDE will automatically work in Atmel Studio (with the Visual Micro plugin installed). The result is that Atmel Studio requires no additional learning or configuration to support, not just for genuine Arduino technologies but also all of the others such as Attiny, avrIO and many more. If you encounter difficulties, need help or simply don't like a feature and want it changed then please join our forum and let us know. We listen to everyone and actively seek to improve. The following example shows an arduino in debug, running without delay. Two trace points have been set, one every 250 milliseconds and one conditional on the triggering of a counter based function. Breakpoints and Tracepoints support a range of additional properties such as conditional statements, please see the wiki for more examples. note: the image below is out of date. debug is enabled automatically in visual micro versions since 2013. So ignore the setting highlighted in the property window below. 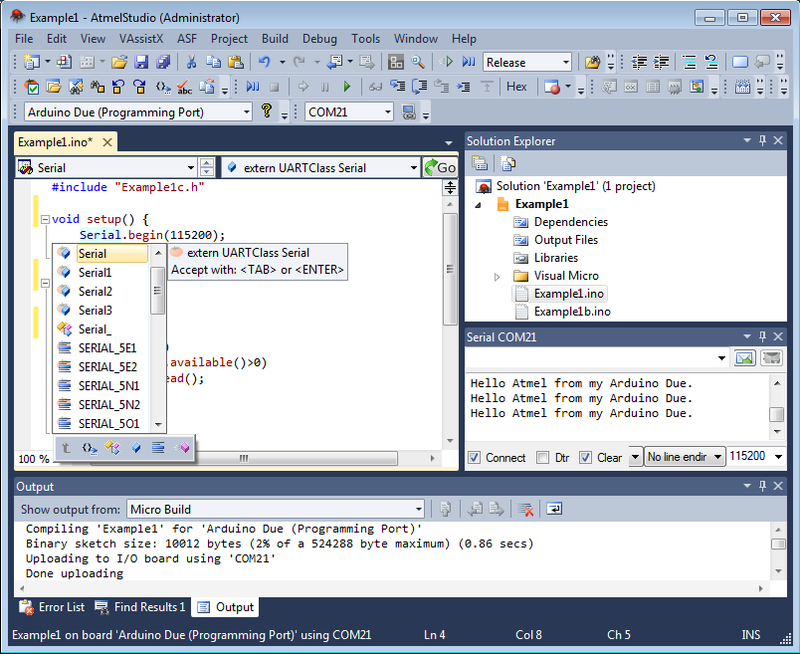 The Visual Micro plugin for Atmel Studio is almost identical in operation to the Visual Studio Arduino plugin so all of the documents on this web site now also apply to Atmel Studio. The single Visual Micro installer installs the plugin for Atmel Studio and also for Visual Studio 2008, 2010 and 2012. Switching between various Arduino boards (or custom boards), adding Arduino libraries, compile and upload are all provided with single click ease. Any/all Arduino projects can be opened and compiled without need for configuration change. A highly optimised compiler produces identical output to the Arduino Ide in a fraction of the time (optimization can be disabled for advanced use). Switching between different versions of Arduino or different Arduino sketchbook folders reflects instantly into the Atmel Studio user interface, no need to re-start the ide (subject to Atmel known intellisense minor bug fix). In the following simple example, you can see that we have switched on background highlight for the current Arduino code line and also changed the brace matching color from black to purple. We also set local Arduino code variables to appear in bold. In Atmel Studio you will find the VAX options are on the top menu. Click the "Display" node to find the options discussed above. Visual Micro provides a software debugger for Arduino which will work for most projects and requires just a usb cable or radio such as xbee. The Visual Micro debugger will work directly with the Arduino .ino source code and cpp source codes of the current sketch. Atmel Studio also provides more advanced debug features for more advanced users who own a hardware debugger such as ICE or who are using 32 bit boards such as the Arduino Zero. To access the hardware debugger either convert your project to a standard atmel studio gcc project or build with Visual Micro and click "File>Open Object File for Debugging". If you use a native Atmel Studio debugger you might find that reducing the optimization level in the project properties of the debug project will be required otherwise some breakpoints or variable data will not be detected. The Atmel Studio 6.2 version of Visual Micro is slightly less functional than Visual Micro for Atmel Studio 7.0. One remarkable difference is that Visual Micro, in AS6.2, does not support the #conditional and deep search "library includes" auto discovery feature that was released in Arduino 1.6.6. All required libraries must be #included in the project_name.ino, regardless of their use only in .cpp sources. All library #includes will be linked regardless of preprocessor #conditions. This is historically how Arduino has worked and also applies to Visual Micro for Visual Studio 2010.